Moreau Lake State Park is located in the Palmertown Mountain Range, between Saratoga Springs and the Glens Falls area, in both Saratoga and Warren counties. Discover the park’s beautiful scenic views and challenging terrain on both the shores of the Hudson River. Come camp (mid-May to mid-December – cabins year round), non-motorized boat, swim, fish, and explore the many trails available for hiking, biking, snowshoeing and cross-country skiing. 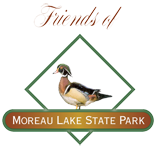 Remember to stop by the Nature Center, supported by the Friends of Moreau, where environmental programs and numerous interactive wildlife displays may be experienced. The lake lies amid hardwood forests, pine stands and rocky ridges. Shady groves of trees shelter picnic grounds and a pavilion overlooking the lake. Wooded campgrounds are quiet and secluded, offering facilities for group campers, as well as tent and trailer sites. Two pavilions, each with a 120-person capacity and a 20’x30′ tent which can accommodate up to 75 people, may be reserved on a daily basis. The sandy beach, nature, hiking and cross-country ski trails, opportunities for non-motorized boating, fishing and ice fishing, and proximity to the Saratoga Springs and Lake George areas make the park attractive to visitors. The Moreau Lake BCA is within Moreau Lake State Park. Moreau Lake BCA is a stopover site for Neotropical migratory songbirds especially forest dwelling migrants during both spring and fall migrations. The site supports a diversity of birds associated with upland forest. It is also a significant wintering site for the state and federally threatened Bald Eagle and regularly supports state threatened Pied-billed Grebe (possible breeder) and Northern Harrier (spring and fall migration); and state species of special concern Cooper’s Hawk (possible breeder) and Red-shouldered Hawk (probable breeder). Moreau Lake is 128 acres in surface area, 3.6 miles of shoreline, average depth of 32′ and maximum depth of 50′. The round, bowl-like shape of Moreau Lake provides a clue as to how the lake was formed. Moreau Lake is considered a “kettle-hole” lake. Over the past two million years, four different glaciers moved south during the ice age, covering the area with glaciers up to a mile thick. When the last glaciers retreated about 10,000 years ago, a huge block of ice became separated and was left behind. That isolated block of ice then became partially buried in meltwater sediments. When the ice block eventually melted, it left behind a depression in the sediment that filled with water. The sandy, gravelly shores and bottom of Moreau Lake are the sediments that surrounded the now filled depression we call Moreau Lake. A watershed consists of all the land that drains to a particular location. When a drop of water falls on the land and runs toward a body of water, that land is said to be part of the pond, lake, stream, or river’s watershed. Because Moreau Lake’s 670-acre watershed is almost entirely within the park boundaries, state park staff have been able to protect the lake’s water quality. By maintaining the natural, mostly forested buffer around the lake, preventing motorized boats of any kind, and using only sand (never salt) on park roads in the winter, the lake has remained unspoiled and open for swimming since the park opened in 1968.